Waterplants of the ACT Region – a glove box guide. This easy to use booklet covers a selection of free-floating plants, instream plants of pools and riffles, mudflat and emergent plants and clump forming water edge plants. Photos to assist with the identification of named species are provided. Pest plants in each environment along with appropriate treatment and control methods for each one are included to assist with the handling of these plants which are usually ‘growing successfully in the wrong place’! A list of further reading materials for those who would like to learn more on the subject is provided. Further information is available at http://www.molonglocatchment.org.au/ Copies of the booklet are available from the Molonglo Catchment Group – 62992119 and Waterwatch ACT – 62072246. We are seeking articles for the June-August 2011 issue of Australasian Plant Conservation (APC), the bulletin of the Australian Network for Plant Conservation (ANPC). The issue will be on the theme ‘Doing it ourselves—non-government conservation’. 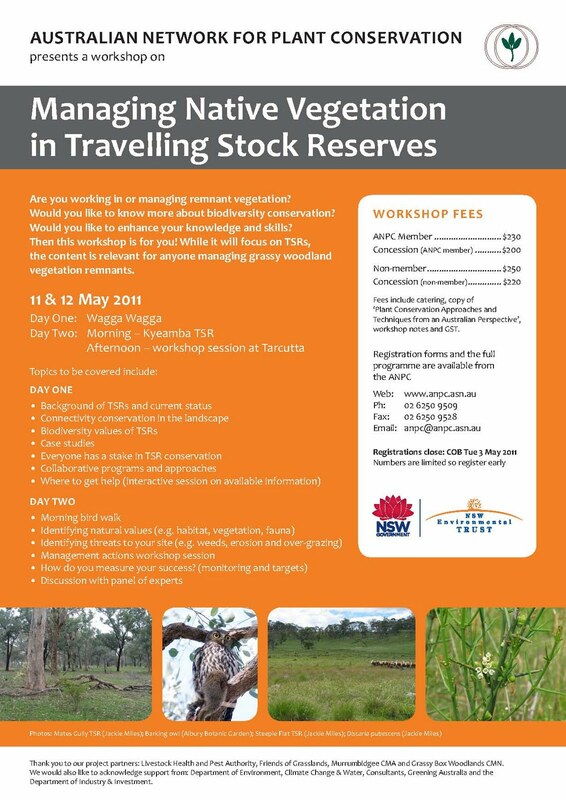 This theme covers the range of mechanisms being used to help achieve plant conservation on private land. 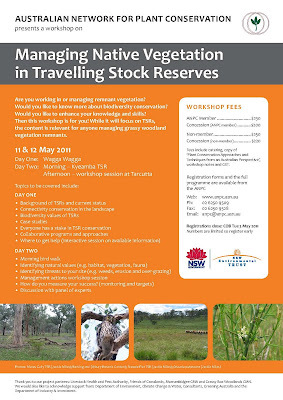 Such mechanisms can include: · -frameworks established by individual land holders, · -the operation of Conservation Management Networks, · -the use of Voluntary Conservation Agreements, Heritage Agreements, Covenants and the like, -purchase and/or management of land by bodies such as Bush Heritage Australia, the Australian Wildlife Conservancy, the Trust for Nature in the various states, and other non-government organisations, · -the operation of market-based instruments on private land, · processes used by NGOs such as the national, state and regional Australian Plant Society (Society for Growing Native Plants) groups, · -any other mechanism aiming to promote plant conservation on private land. We wish to explore the effectiveness of these mechanisms in achieving on-ground plant conservation outcomes, their strengths and weaknesses, lessons learnt, and what each mechanism has achieved. Articles can range from overviews of some/all of the mechanisms to case studies illustrating particular examples. While the focus of the issue is not on-ground actions, such types of activities are relevant to the theme if they provide examples of ways of helping to promote/support plant conservation mechanisms and doing plant conservation business. General articles not on the theme are also welcome. Articles generally should not exceed 1200 words and authors are encouraged to submit two or three high resolution images to illustrate their article. We also welcome: · -book reviews · -titles of interesting recent publications or resources, and where they can be found · -conference, workshop, course and fieldwork announcements · -details of relevant publications, -information resources and websites. Deadline for submissions for the June-August 2011 issue is Friday 13 May 2011. If you are intending to submit an article or wish to discuss possibilities, please contact the Editor, Selga Harrington, by 29 April. Your final article must be submitted to Selga by email at SHarrington@pb.com.au. Guidelines for authors about the APC style and scope are located on the ANPC website.